However you want to say it, my two little tomatoes have made me so happy! 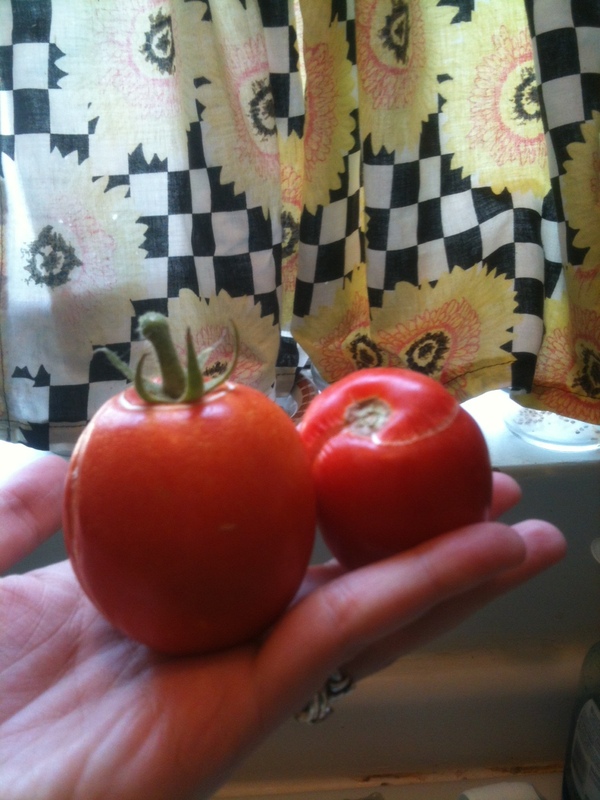 Two little tomatoes can be quite an exciting harvest. I have around six tomatoes plants. They sprouted up from everywhere. From inside the cactus pots. From in the Easter lily container. From a random pot that contained something last season, but was a vast wasteland of dirt since last fall. From cast outs and forgotten, rotten, bottom-of-the-veggie-drawer tomatoes, my little tomato plants grew. You see, my mother chunked them outside into planters hoping for the best. It amazes me. From one tiny little seed, a plant grows — sometimes in the oddest of places. My mother and I enjoyed our tomato babies with fresh avocado diced into a lovely salad. I feel like that tomato plant. I feel like I got chunked into a place. Not the place I would have chosen. Not the place I thought I could grow. But, God chunked me here. And, with Him, I sprouted roots and reached for the sun. Or, maybe I should say Son. I was gross and rotten, too, before I knew Him. We all are. We are all sinners and yucky and moldy. We do things we shouldn’t. We say things we regret. But, one things for certain. With God ALL things are possible! HE changed me. HE chunked me into a place. HE watered me. HE fed me. And, He watched me grow. And, when my little leaves were too weak from the hot Texas sun, HE held my stems up so I could praise Him and keep growing. And, the best part: Now that I know Him, He searches my heart every moment and shows me how to be more like Him — A faithful Christ follower who HE can now use to help someone hold their stems up and reach for the Son, too. He wants the best for us. Allow Him to water you. Thank you, mom (And God) for the chunkin’.